Chapter 4 Case Study: The Public Face of Christian Career, Calling and Profession …. I was privileged to interact this spring with a professional in my local community (Jeff) who was starting up a medical oriented business that he ‘wanted to glorify God.’ He asked me if we could gather together to discuss the possibilities and look at his business plan. What a great opportunity to thinking about career, calling, and profession within a business. We also had a great opportunity in class to hear from Don Flow of Flow motors … who has successfully integrated many Christian Principles into a retail operation. In studying Faith Integration in business over the past decade or more, it seems to me that there are many kinds of ‘Christian’ Business, and that certainly scripture does not favor one over another (ie almost all seem as if they good be done deliberately, but each one will as a result have certain strengths and weaknesses and will be prone to certain types of structural sin based on how they are set up and by whom.) For example RG LeTourneau started Caterpillar corporation as a Christian Business. It isn’t that today, and the vision for it as such died with RG. It retains many values of the original but it is a publicly traded company without a whole lot of it’s original ‘God is my business partner’ flavor. So who is involved in the integration is in my thinking and experience more important or as important as how a business is set up. My belief is that there are no real Christian corporations or businesses, only corporations and businesses with Christians who have a vision for faith integration involved… this can change quickly and often does so (for better or worse.) Corporations as institutions are earthly fallen constructs, and will not last for eternity. They can influence and develop people and perhaps even things that will last for eternity, but in the long run they will have no use in a glorified future reality – new heavens and new earth. With all that said , Jeff and I sat down for breakfast and I asked him a number of questions to think through in his definition of what a ‘small business that would glorify God’ might look like. It was helpful for both he and I. Let me share some of those questions with you, because I think that they will be more helpful than the answers he came up with …. (1) How far did he want the faith orientation of his business to extend into the public arena? (2) At what level would a ‘Statement’ of Faith Orientation / Integration be made? Would he make these values and mission something that would (a) hang on his wall as a reminder of his own personal creed (b) would it be hung on the office wall as a reminder to the organizations employees as well, or (c) would the mission and values of the practice be hung on the waiting room wall for all (customers and business partners) to see. (3) What were the primary motivations to saying yes or no to any or all of these levels? Was the reason for the decision about Faith Integration a good (dare I say Biblical?) motivation or a bad (non-Biblical) one? (Profitability, Public Image, Ability to have integrity – ie Living up to the creed.) For example some business owners make a decision to be a ‘Christian’ Corporation based primarily on marketing considerations… it builds relational trust with other Christians as a source of income. I have some personal horror stories about guys with the ‘Icthus’ symbol without much to back it up, you may too. At the end of the day they weren’t worried about faith integration, I can tell you that much! (4) How should he think about profit and the poor in the context of mission? What would some of the resulting practices be in terms of patients who lacked the ability to pay, found themselves unable to pay after the fact, or would need to be turned over to a credit/collection service. I would propose that there are three progressive (each one assumes the previous) philosophical levels possible and they in some senses correspond to the three levels (or steps) of faith integration proposed in Professionals: Men and Women Partnering with the Trinity in Everyday Life. I also would propose that all three levels are very possible and easy to carry out at a sole proprietor level, but they become harder and less sustainable as businesses grow in size and complexity. It can be and is often done, but retaining the original flavor and design of faith integration rarely extends beyond the first generation of leadership in anything beyond family/privately held organizations. 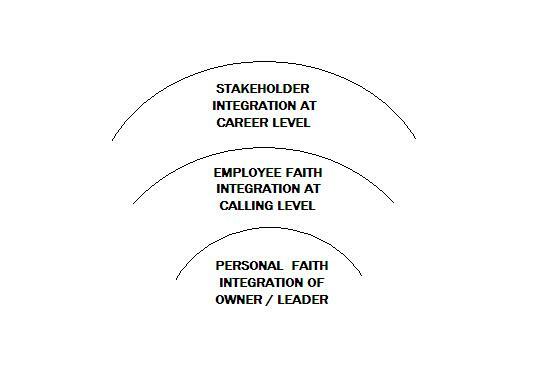 (1) Personal Faith Integration (Hang the vision statement on the owners office wall) – The owner or leader integrates faith as a career, calling and profession. But does not require the same of employees or other business stakeholders. (2) Employee Integration (Hang the vision statement on the business office wall) – The owner or leader integrates faith as career, calling and profession. He also requires employees to hold to career and calling motivations. He does not require anything from other business stakeholders. (3) Full ‘Public’ Integration (Hang the vision statement on the waiting room wall) – The owner or leader integrates faith as a career and calling and profession. He also requires employees to operate with both career and calling level. He expects that customers and business stakeholders will operate at a career level. I would say that I have seen businesses do all three of these well and all three of these poorly. The opportunity to do poorly grows as the complexity of the business grows, as does the opportunity to really do a stellar job of impacting the Culture in meaningful kingdom building kinds of ways. I’d love some outside perspective here as well if you have one ……. These comments by Rob are very helpful. I would offer these additional thoughts. The concept of “shalom” offers an opportunity to think about the purpose of business. In the OT, for shalom or the “flourishing of life” to exist, we see goodness, beauty, truth, justice, and plenty as the primary underlying conditions. In a market capitalism, we refer to these as social capital (good), intellectual capital (truth), aesthetic capital (beauty), political capital (justice) and economic capital (plenty). The role of business is to create economic capital. This is its legitimate creational purpose and contributes to the flourishing of life when it provides this function. However, for economic capital to be shalom building it must not be a net consumer of the other capitals. That is to say, shalom creating economic capital is not a destroyer of social, intellectual, aesthetic, or political capital. If it does so, it has abandoned its legitimate calling in creation. So Christians have a “priestly”, “kingly”, and “prophetic” responsiblity when it comes to economic capital (just like they do regarding every other kind of capital). At a personal vocational level, Christians have the responsibility to look to be agents of redemption in whatever place, in the sovereignty of God, they are living out their faith. This changes over the course of our life in Christ and our particular type of work. I want to suggest three basic, broad stages for thinking about this: new Christian, maturing Christian, mature Christian. 1. New Christian: Exercising Faith. Re-orienting of the self to Christ: desire (behold Him), belief (Believe in Him), identity (Belong to Him). 2. Maturing Christian: Living Love: Incarnating Christ: character, culture, and community. (Become like Him, Bear His fruit). 3. Mature Christian: Bringing Hope: re-envisioning, reforming, reweaving (Bless His world, Bring forth His justice). It has been my experience that few Christians move past the 2nd level regarding their work. I think this is primarily because churches are not equipped to help them think through the 3rd stage (in fact, few are actually prepared to talk about the 2nd stage). Additionally, few churches are prepared to address the vareity of issues that Christians face because of the different roles they play in the work place (operational, managerial, executive). When these issues are combined with different stages of the Christian life, most of the advice given sounds simplistic or irrelevant (The new Christian who is a CEO is not thinking about reforming capitalism. He is trying to learn what it means to exercise faith, to pray, to desire to be a follower of Christ. The mature Christian who operates a machine is not trying to reform the company, but he/she is interested in redeeming the space that God has provided). As more more Christians are engaged at the executive level of organizations, there is a wonderful opportunity to engage with a wider audience about the nature and purpose of business and to effect significant change. I am in touch with folks who are deeply grappling with this. But every Christian has a responsbity to ask what “faithfulness” looks like in whatever space and wherever they are in their walk with Christ.